“All I said was that he has short legs; that he has very short legs. I don’t know David to dislike him. I just didn’t like it when he started saying things about putting people dead in a coffin. That puts the sport into disrepute,” WBO middleweight champ Billy Joe Saunders, talking this week ahead of tonight’s defence against dangerous puncher David Lemieux in Canada. In truth, Saunders had said (and written, on social media) quite a few nasty things when getting into fight-mode for tonight, and the unbeaten southpaw has continued to chuck insults Lemieux’s way. Still, it’s far from a one-way street, and Lemieux has said again and again how tonight’s fight “will be very bad for his health.” Both men are predicting a KO; Lemieux basically promising he will deliver one. Make no mistake, there is genuine bad blood between these two, even though it’s likely that neither guy could sit down and tell you just where the bad feeling came from. Regardless, these two now have to fight and settle their differences. It’s a great match-up that promises a great fight. Lemieux as we know can punch with hurricane force, while Saunders, on his best day, is as slick, as tough and as effective as any middleweight. This is the big fight BJS has been calling for; one he sees as a ticket to the really big fights. But Lemieux, who will be enjoying hometown advantage tonight, roared on as he will be by thousands of supportive Canadians, for whom he has convinced he will put on a quite brutal show, is determined to crush the defending champ. 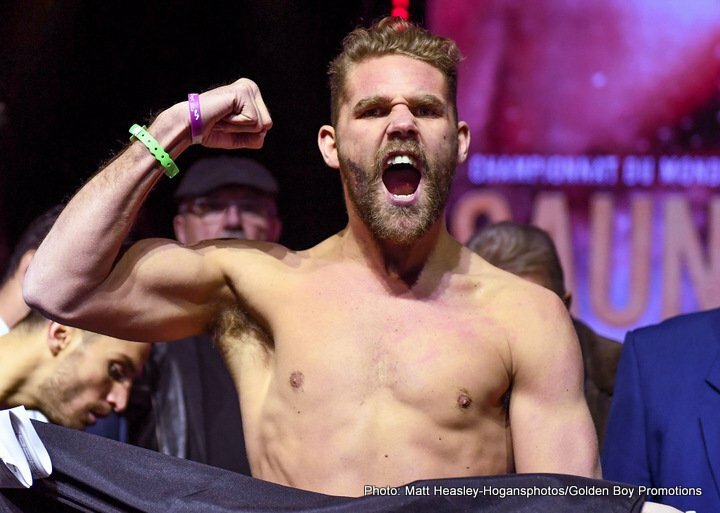 Still, Saunders – who deserves real credit for agreeing to face HIS mandatory in his challenger’s homeland – doesn’t appear to be fazed in any way. In fact it’s just the opposite: Saunders, 25-0(12) might just have got sufficiently under his challenger’s skin. Lemieux is telling us all he will score a KO, is it possible that what he really means is this: he HAS to score a KO to win. Can a fighter, any fighter, try too hard to get the KO, to find it? Yes. Could this be the case with Lemieux? Yes again. Lemieux, 38-3(33) is a fighter who has in the past grown discouraged when he has failed to land his big bombs, and he can certainly be out-boxed. Saunders, who says Lemieux has feasted on bums (his losses aside) and that he is a mentally weak person, tells us he will break him. To this writer, tonight’s fight is reminiscent of the Joe Calzaghe-Jeff Lacy fight of 2006. Calzaghe was, like Saunders, unbeaten and finally getting himself a big, big fight after a series of disappointments. Lacy, like Lemieux, was the fearsome puncher who most were picking to do a demolition job. Calzaghe really put everything into the fight, putting on a brutal and humiliating masterclass; releasing a fair amount of frustration as he did so. Calzaghe did not have to travel for the fight but, as Saunders has said this week, a ring is a ring. Might BJS rise to the occasion, put it all on display and win in commanding fashion as he finally realises his own full potential? Lemieux is ultra-dangerous and can never be written off, but the pick here is for Saunders to deliver a stunning performance of his own as he widely decisions Lemieux, punishing him and demoralizing him plenty along the way. Maybe BJS will even beat Lemieux so badly he makes his corner make the decision to pull him out? It will be one sweet night for Billy Joe Saunders tonight.